The Research Enhancement Program (REP) provides a range of research-based workshops designed to enhance the careers and learning of Higher Degree by Research (HDR) Students, HDR Supervisors and Research Staff across the University. This program is coordinated by the Office of Research and Innovation. The intention of the program is to increase the breadth of research training for CDU students and to include skills that employers expect of research graduates. All students commencing a Higher Degree by Research program are currently required, as a condition of their candidature, to participate in a minimum of five generic skills workshops/seminars throughout their candidature. The May workshop program will be published here and on the HDR Student email list in March. 2 day HDR Student Conference (5th and 6th September). See 2019 CDU HDR Student Conference webpage for more details. External students are expected to use some of their minimum time on campus* to attend these workshops. To apply for funding to help with the costs of travel to darwin to attend workshops or the conference, please contact your college Admin. Registration for workshops generally opens 6 or more weeks prior to the workshops commencing, and closes two weeks prior. Some workshops have limited space and you, or others, may be placed on a waiting list if it becomes full. It is therefore important for you to notify the Office of Research & Innovation asap if you know that you can no longer attend a workshop. We will then offer your place to someone on the waiting list. CDU’s Entrepreneur in Residence Dean Alle ran a series of interactive workshops to help HDR Students to become “entrepreneur ready” and find out what it means for their potential careers. These workshops were aimed at students who are have active collaboration projects and students that are curious and would like to better understand this space. Please note that the Library workshop that was scheduled for Friday 7th September has now been postponed until 13th September. Please contact the library for more details. Write like a winna! Writing group – all welcome. An informal writing group organised by HDR student Kat Tuite. See program below for more details. Research Grant Writing Workshops for Staff held on Wednesday 2nd of May. There were 21 workshops in this program which ran from 4 - 8 September 2017. There were workshops for students at ALL stages of their candidature as well as supervisors and other researchers. 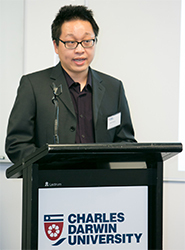 The 2017 CDU Three Minute Thesis (3MT) Final was on 8th September. See our Three Minute Thesis page for more information and find out who the winners were! The Library hold a number of research focussed workshops throughout the year, as well as those listed in the Research Enhancement Program. Find out more about the library workshops on the Library workshop page. The Academic Language and Learning Success Program (ALLSP) is a free, confidential service that assists all higher education students (including PhD and Master by Research students) with academic skills development. ALLSP can organise workshops on particular academic topics (including, grammar, editing etc) for groups of students. They also offer individual appointments to assist students. For more information visit the ALLSP webpage. Topics that may be of interest include Time Management, Excel, Powerpoint & More. Navigate to the link below and it will take you to the Lynda.com sign in portal. Please provide CDU staff email and click on continue. This will then redirect you to CDU sign on portal. Log in using staff user name (e.g. Jsmith1) and password. For more info go to the CDU Lynda.com info page. Charles Darwin University (CDU) has purchased a licence for the Vitae Networking tool to be used by researchers and HDR candidates to develop networks and support researcher professional development. To use this tool you need to create your own login and register on the Vitae website (opens in new window). Please note that you need to use your official CDU (or Menzies) staff/HDR Student email address to be eligible to join. Vitae provides online researcher development, gives tips on supervising and managing researchers, provides training course options and will keep you up-to-date with researcher news. It is an online researcher community with face-to-face options. The Australian Consortium for Social and Political Research Incorporated (ACSPRI) is a not-for-profit organisation formed in 1976. The broad aim of ACSPRI is the promotion and enhancement of social science research and methods in Australia. Its most prominent activities are the regular training programs in social research methods and research technology. Further information on ACSPRI and the workshops they run can be found on the ACSPRI website. CDU is an ACSPRI Member Organisation. Therefore all CDU staff and HDR students are eligible to receive the Member discounted rate to attend these workshops. The Office of Research & Innovation will conduct or organise Research Enhancement Program workshops in Alice Springs from time to time if their is sufficient interest from HDR students, Supervisors and Researchers based there. Please contact research.degrees@cdu.edu.au if you have any queries, comments or suggestions about Alice Springs workshops. External students are expected to spend 9 weeks of candidature on campus, as part of the HDR - Conditions of Candidature Procedures. External students may apply for credit towards their 5 compulsory workshops if they attend workshops in their local area that are similar to what is offered is offered by the Office of Research & Innovation. Current or Past workshop programs which can be fund on this page, may be used as a guide to what is offered. For more information, please contact research.degrees@cdu.edu.au in the Office of Research and Innovation. The list of Frequently Asked Questions provides information about HDR Generic Skills Requirements and suggested workshops for each stage of your Postgraduate Study.